After Anck-su-namun's internment, Imhotep breaks into the crypt and steals her corpse. He and his priests then flee through the night across the desert to Hamunaptra where they commence the resurrection ceremony. They are caught, however, by Seti's guards before the ritual can be completed. Anuk-su-namun's soul is thus sent back to the Underworld. As punishment for this sacrilege, Imhotep's priests are mummified alive and Imhotep himself is forced to endure the curse of Hom Dai: Imhotep's tongue is cut out and he is buried alive, wrapped like a dead mummy, along with a swarm of flesh-eating scarabs. The horror of the ritual is that it grants immortality but not invulnerability, so that, unlike his priests, he is unable to die and must endure the agony of his wounds for all time. Imhotep is buried under high security, sealed away in a locked sarcophagus below the statue of the Egyptian funerary god Anubis, and kept under strict surveillance by the descendants of Seti's palace guards. If he were ever to be released, the powers that made him immortal would allow him to unleash a wave of destruction and death. Three thousand years later (actually 3,213 years), in 1923, Richard "Rick" O'Connell (Fraser), an American serving in the French Foreign Legion, barely survives a battle at the ruins of Hamunaptra, his Arab enemies fleeing from the cursed statue of Anubis. Three years after this, Cairo librarian and aspiring Egyptologist Evelyn Carnahan (Weisz) and her bumbling brother Jonathan (Hannah) contact Rick while he is imprisoned and sentenced to be hanged. When he reveals that he knows the location of Hamunaptra, and the treasure of past pharaohs that it contains, Evelyn bargains for his life. He is then recruited into an expedition that quickly becomes a race against another group. This latter is composed of Americans, who are being led by Beni Gabor, an old army colleague of Rick's who also knows how to find Hamunaptra. Both groups trying to reach Hamunaptra are attacked by members of a secret society, lead by Ardeth Bey (Oded Fehr), devoted to making sure the creature never awakens. However, both groups make it to the city nonetheless, where everyone excavates old artifacts in search for the Book of the Dead. While exploring the city they come across several traps, such as parastic beetles that are hidden in hollow golden beetles, and pressurized salt acid. Evelyn "borrows" the book and reads a page of the Egyptian language. Imhotep is accidentally released by this and begins killing the Americans, due to the fact that they opened the box which played a part in the curse by holding the sacred canopic jars. Beni survives a meeting with Imhotep by pledging allegiance to him and helps Imhotep later track down the Americans. Imhotep eventually brings the Ten Plagues of Egypt and captures Evelyn, intending to use her to resurrect his long-dead lover, Anck-su-namun. Rick and Jonathan rescue Evelyn and thwart Imhotep's resurrection attempt. 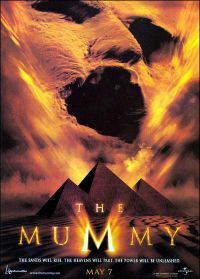 Evelyn reads from the golden book of Amun-Ra, which takes the mummy's immortality, after which Rick kills his mortal body by impaling him in the chest. As they are leaving Hamunaptra, Beni falls behind to plunder the treasures of the lost city and is trapped by a swarm of flesh-eating scarabs. The heroes ride off into the sunset on camels, as yet unaware that their saddlebags are packed with treasures Beni looted earlier.